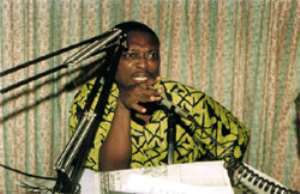 The Editor-in-Chief of the “Crusading Guide” newspaper, Mr Kweku Baako Jnr. has professed his love for the Kufour Government which he indicated, is reflective in some of the news items carried by the paper. However, he said, it is naivety on the part of anyone to read monetary gains into the discharge of his duties. The “Crusading Guide” editor made these comments in reaction to some public perceptions that he had been bribed by the NPP Government to carry out its objectives, hence his treatment of the government with kid gloves. Speaking on Peace FM's “Kokrokoo” Morning Show today, May 26, the former Journalist of the year, stressed that the motivation for what he does is in no way related to money. According to him, he is “a rebel with a cause". He questioned why the public did not impugn improper motives in the performance of his work when he put the conduct of the PNDC/NDC government under the microscope.